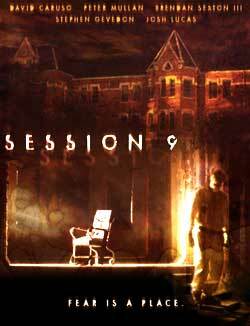 Horror comes home to us with ex-Bostonian Brad Anderson's effective goth chiller, Session 9, set nearby at the real-life Danvers State Hospital, decrepit and abandoned, which, in its heyday, was holding place for an army of mental patients and the proud Massachusetts center for lobotomy operations. Anderson co-wrote a site-specific fictional screenplay which, developed by Boston's enterprising Scout Productions, could be made low-budget at this ghostly locale. A crew of workers have been hired to remove asbestos from this shut hospital, and their contract stipulates they have one week to do it. But this blue-collar team are an anxious, angry bunch, running on empty in a kind of Russell Banks way; and their internal demons keep interfering with the job. Among the worst-hit: the crew's Scottish emigrant boss, Gordon (Peter Mullan), whose marriage is making him crazy, and revengeful crew chief, Phil (David Caruso), whose girlfriend has run away with a studley guy in his employ. A generic horror movie? Anderson has professed his love for the Val Lewton-produced films of the 1940s  The Cat People, The Seventh Victim, etc.  in which real-life, ordinary people, find themselves in horrific situations which can be read materially or otherworldly, your choice. So it is with Session 9, which is damned scary once the men are at each other's throats, whether or not there's something supernatural crawling around in the bowels of the hospital. The acting ensemble is first-rate, and Anderson (The Darien Gap, Next Stop Wonderland) gets better each movie working with seasoned professionals. But the superstar here is Uta Briesewitz's dazzling, groundbreaking 24P HD digital cinematography, turning that hospital into an ambient, breathing, mega-haunted house.